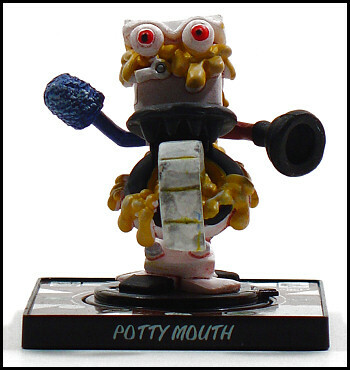 Potty Mouth is a repaint of Swirly. Yes, I'm exceedingly sick of recolors by this point, but at least Potty Mouth is a cool one. While he's not on the level of some of the repaints that we've seen, the piss-yellow water and blackened rim and teeth take the grossness factor up a notch where Swirly looked as if he'd never been used. Besides, I really dig the toilet-head monsters for what they are -- I never had a Fearsome Flush toy as a kid, but these guys definitely fill that empty spot in my collection. SKELEHOMIE!!!!! Even though he's not the best Creepy Freak in terms of his motif, Skelehomie was coveted by many (or at least I assume he was by people who actually played the game) for another reason -- like Pikachu of Pokémon, Skelehomie was shown to be the flagship monster in the Creepy Freaks cartoon. Aside from a couple of the evil characters, he was the only Creepy Freak to have a speaking role. And speak he did -- I think he got in more lines than any other character in the show, humans included. In fact, with respect to the comics that come packaged with the Creepy Freaks, he's the only monster who appears in comics that aren't his own. Skelehomie owns. So yeah, I'm really glad to have him, as he's like the one character that one has to have even if the player doesn't find him to be all that valuable in the game. Is he creepy? No -- if his speech was any indication, he's probably the most down-to-earth and "normal" of all of the Creepy Freaks despite being a living skeleton. Is he freaky? No -- unless you'd be freaked out by an ultra kid-friendly version of Snoop Dogg who'd sooner break dance than smoke a joint or engage in any illegal thuggin' activity. But he's been actively promoted by the creators in animation and print, and that always goes a long way towards making characters cool. Just look at Psyduck! 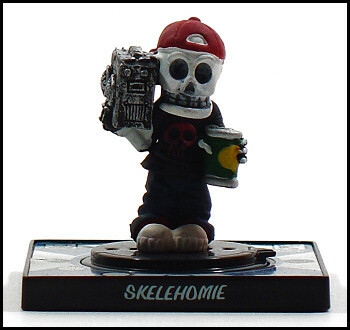 Hmm, Skelehomie looks more like a cheap Day of the Dead (the mexican celebration, not the movie) statue then a Creepy Freak toy. Actually, this is a pretty cool batch this time. Potty Mouth and Skelehomie do seem to be two of the better creepy freaks. As I said last time, I think the whole Pok�mon / Madballs hybrid thing they had going was cool, but they seriously needed variety. I think you should do an article, where you share with us ideas that you think would have made good Creepy Freaks. Either way, I hope to see some of these guys in upcoming DPH comics. I found some more Power Ranger parodies, this time on Newgrounds.